Lalo Gonzalez, a 24-year-old student working toward his teaching accreditation, doesn’t mind getting arrested if it gains awareness of what’s currently happening at City College of San Francisco. On Feb. 21 starting at 1 p.m., a group of CCSF students, including Gonzalez, rallied together on their campus to protest the administration’s lack of communication with students over the accreditation process the school is going through. According to an ABC7 report, there are currently about 30 students occupying Conlan Hall. There is no word for how long the students will stay there. As a member of Save CCSF, Gonzalez helped organize the protest. He feels that the occupation of Conlan Hall — a CCSF administration building — is a necessary step in preserving the future of the school. “I know that if I don’t take this risk there may not be classes in the coming semester,” Gonzalez said. CCSF may lose its accreditation next month, which would effectively close its doors to thousands of students. In order to remain accredited, CCSF must make changes in the way the campus is run. 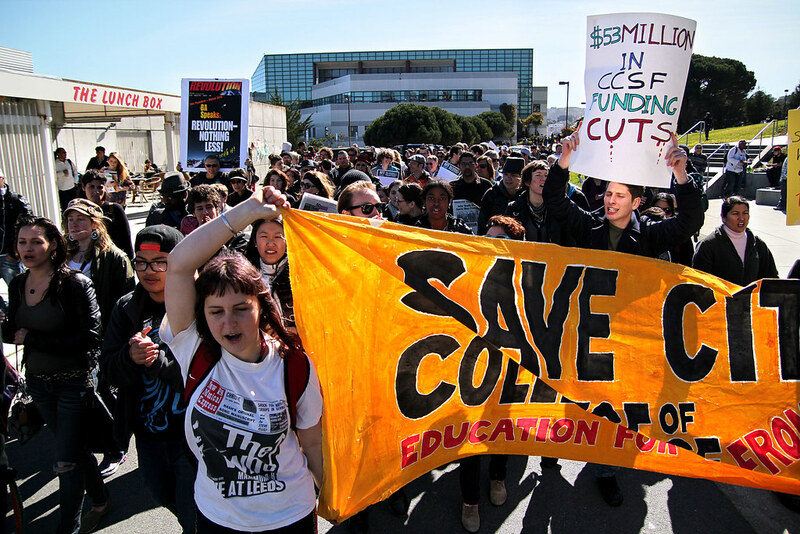 According to Save CCSF the school would be forced to eliminate classes, programs, and cut wages. Samuel Santos, associate dean at CCSF was caught off-guard by the protest — he didn’t know that it was happening until the day of the event. Santos, however, welcomes student activism with open arms. The protest started around 1 p.m. at Ram Plaza in CCSF. The group of students then circled around the campus a few times and met back at Conlan Hall to discuss further action for the protest, according to student reports. Norma Ruiz, 32, and a CCSF student studying public health, participated in the event. As the first person in her family to go to college, she stands to lose the bridge between the present and a successful future. As a faculty member at City College, I wanted to send out a message to all our students that instructors at the college have been working tirelessly to implement changes in accordance with the new guidelines required by the Accreditation Committee. An impressive amount of work has been accomplished college-wide in the reconsideration, assessment and documentation of student learning outcomes. Good communication is taking place within departments and among disciplines. Considering the size of our community, the diversity of our course offerings, and the timeline we were given, what we accomplished demonstrates our strength. We trust that our efforts will be recognized and credited by the Accreditation Committee. We will continue to work round the clock as long as we need to and do our very best to see the college through this accreditation crisis. Our students deserve continued access to education and they deserve the very best in quality. Thank you, CCSF students for standing up and speaking out. 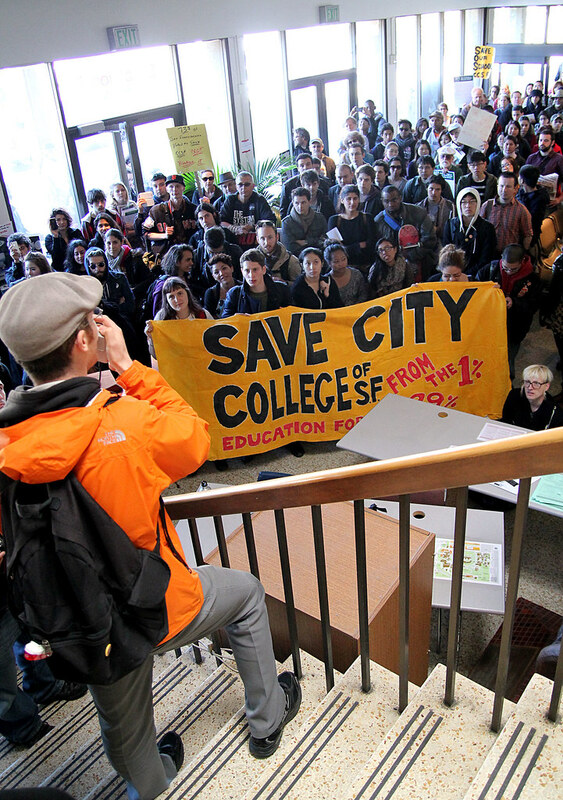 As a CCSF faculty member, I appreciate your commitment to saving our school and its programs. Thank you GG Xpress for the clear reporting. This is now an issue that is more in the public consciousness thanks to your actions. The unaccountable accreditors at the ACCJC are imposing Eligibility Standard 4, which calls for hiring career managers with EdDs over teaching or counseling faculty with PhDs and years or decades of direct contact with students, as reflected in the CCSF Discipline Chair system. The ACCJC refused to count these experienced supervisory faculty (carrying reduced teaching & increased service loads) as administrators, despite the administrative functions they perform, preferring the CEO model exemplified by Interim Chancellor Scott-Skillman, who has been an administrator for almost 30 years, and spent 8 years in Sacramento as CCCS Vice-Chancellor at the CCCCO. It’s a neoliberal, managerialist agenda, that treats colleges like corporations, applies the degrading educational “standards” movement to the postsecondary education of adults (creating abysmal working & learning conditions), and dismisses the input of the faculty, staff, & students needed for informed decision-making. This flies in the face of the collegial, 800-year old Anglo-American university tradition, where deans are recruited from senior faculty, as well as faculty, staff, and student CCR Title 5 rights to “meaningful participation” in the shared governance process used to formulate policy recommendation to Boards of Trustees. Accreditation sanctions impose Eligibility & Standards Recommendations for policy changes required to lift them, causing districts to seek legal counsel on interpreting state laws for Board/Administrative Policy provided by the centralized CCLC & CCCCO, and technical assistance from expensive private consultants. As demonstrated throughout the CCC system over the past dozen years under Barbara Beno’s tenure as ACCJC President, districts under threat by accreditors of serious sanctions, or possible loss of the accreditation needed to receive state & federal funds thus forcing closure, district Boards of Trustees & Presidents/Chancellors have used these “emergencies” as rationales to do an end-run around the Title 5 rights of faculty under §53200 & §51023(c), non-managerial staff under §51023.5, and students under §51023.7 & CA Ed. Code §76060. The tight reporting timelines imposed allow districts to invoke §51023.5(a)(5) and §51023.7(a)(2) when bypassing Title 5 rights to “effective participation” by staff and students completely, causing many ill-advised programmatic, policy, and fee structure changes state-wide. However, even such manufactured emergencies do not waive the obligation of district Chancellors & Boards to “consult collegially” with the Academic Senate, and “rely[ing] primarily upon the advice and judgment of the academic senate” on “[a]cademic and professional matters” per §53200 & §51023(c), nor does it permit the violation of Collective Bargaining Agreements with faculty & staff unions per §51023.5(b)&(d), state & federal labor law. More importantly, the constituency most able to identify the programs, services, and policies needed for student success is the students themselves. Lack of hours of adequate hours of access to financial aid, disabled student, and academic counseling which are typically only open Monday-Thursday 8am-4:30pm, due to a combination of staff & faculty lay-off, increased case loads for counselors, and reduced funding of student services. Interim Chancellor Scott-Skillman, the Special Trustee Dr. Robert Agrella, and elected members of the SFCCD Board of Trustees have adopted a consistently condescending, paternalistic tone in dismissing student input, and have rarely sought the formal advice of the duly-elected Associated Student leaders per Title 5 §51023.7 & CA Ed. Code §76060, particularly after the start of 2013, despite heroic efforts on the part of ASEC President Williams, Student Trustee Walker, other student leaders, and concerned students to both represent their constituents, and educate the student body on the nature of the accreditation process. Such behavior speaks to an implicit classism, and is reminiscent of the in loco parentis mentality of colleges before the student movements of the 1960’s. While no one questions their motives, their methods and policy proposals are unacceptable.